The brain’s blood vessels (black) are lined with a membrane that keeps out harmful substances— and blocks nearly 95 percent of medicines. 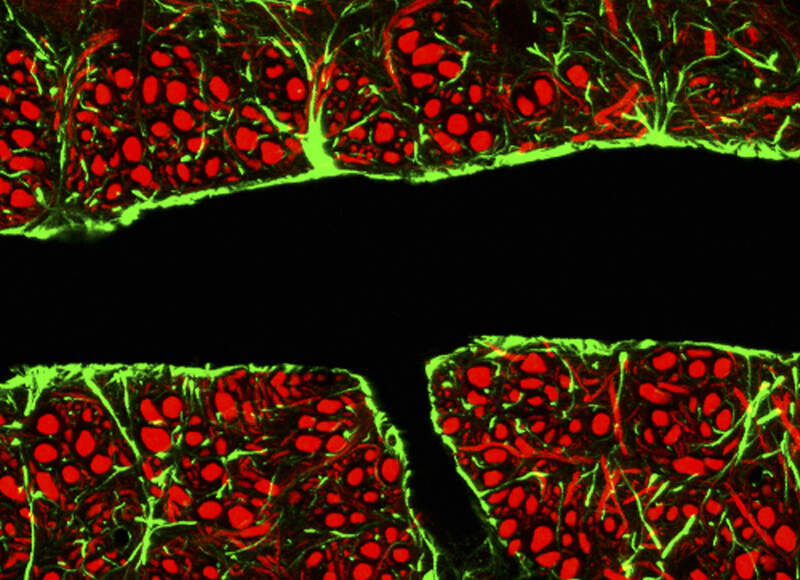 Surrounding the blood vessels are also glial cells (green) that help maintain this barrier. Science is helping cancer treatments and other medicines breach the blood-brain barrier in novel ways. Among all the organs in our body, the brain is the only one to have its own security system. It’s called the blood–brain barrier. Made up of a thin layer of tightly packed cells lining the blood vessels, the barrier protects the brain from harmful pathogens, as well as hormones and other substances that may disrupt the brain’s delicate chemical balance. Heavy defense comes at cost, though. Nearly 95 percent of medicine molecules cannot penetrate this barrier — often because they’re too large — making it a challenge to create medicines for brain tumors and neurological conditions such as Alzheimer’s or Parkinson’s disease. In fact, for decades, medicinal scientists saw the blood–brain barrier (BBB) as a nearly impenetrable brick wall. With advancements in microscope technology, however, scientists have gained a close-up view of how the blood-brain barrier operates. They’re now seeing it as an active membrane with cells on both sides of the partition in constant communication about which molecules to let in. Georgette Suidan, a neuroscientist at Pfizer’s Kendall Square site in Cambridge, Massachusetts, is part of a team trying to further understanding of BBB biology. "There are several aspects to consider when trying to develop medicines that will cross the BBB to treat neurological disease,” she says. “Developing and validating BBB crossing technologies is just the first challenge. We also must have a better understanding of whether these approaches will cross the BBB in appreciable amounts to have the desired effect in the diseased brain. These are some of the questions we work to answer." Traditionally, medicine’s methods for bypassing the barrier have been invasive. Doctors treating patients with conditions such as Parkinson’s sometimes have to make holes in a patient’s skull in order to directly inject medicines into the brain. Recent research has focused on less physically intrusive techniques for crossing the barrier, including using viral vectors and “Trojan horses,” — attaching medicines to non-medicinal substances that are normally able to cross the barrier. In the early 1980s, Dr. Edward Neuwelt, a neurosurgeon at Oregon Health & Science University, pioneered an osmosis technique to temporarily open the blood–brain barrier to deliver chemotherapy drugs. Patients are injected with a sugar solution that temporarily shrinks the cells of the blood–brain barrier, creating openings for medicines to slip through. A recent advance in this technique uses microcathethers — tiny tubes that are inserted into an artery in the groin and threaded up to blood vessels in the brain — that spray the barrier-opening solution, followed quickly by a chemotherapy drug. Another recent innovation pivots around gas bubbles. In 2015, researchers at Sunnybrook Health Sciences Centre in Toronto injected a chemotherapy drug along with microscopic gas bubbles into a patient with a large brain tumor. They then focused ultrasound waves on her skull, which caused the bubbles to expand and contract, creating temporary holes in the blood–brain barrier for the chemo drug to sneak inside.